A few months ago, I received an email from a friend asking me if I wanted to join a trip to Korea. I was definitely up for it since I’ve never been to Korea and I’ve always been curious what it’s like there. Usually when my friends and I talk about traveling, most of the time, South Korea is usually mentioned. A lot say that the sights are beautiful, the food tastes amazing, the people are nice, and of course shopping! 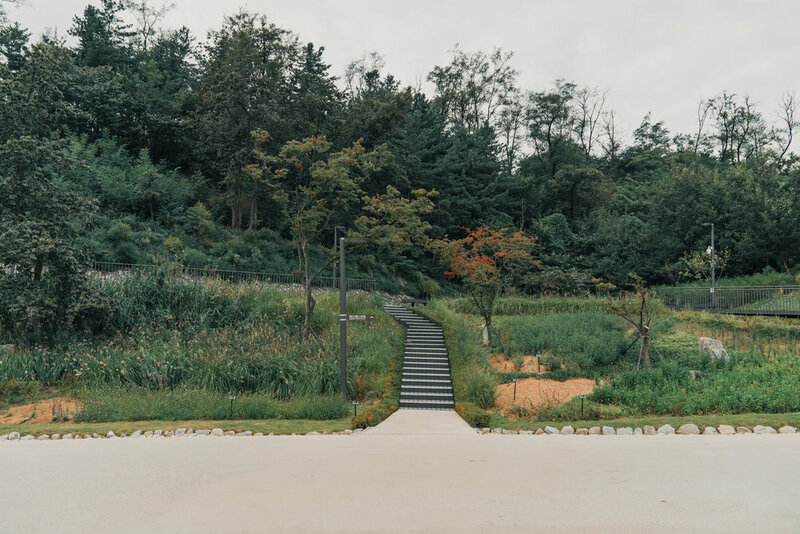 For years now, I’ve been following a few people on social media that live in Seoul and most of the places they share look amazing! A few months after exchanging emails, I was all set! I had my visa, ticket, and the itinerary. Browsing through the itinerary made me super excited for the trip because I saw that we were visiting Dongdaemun Design Plaza which I’ve always seen online and I can’t believe that I’m finally seeing it in person! 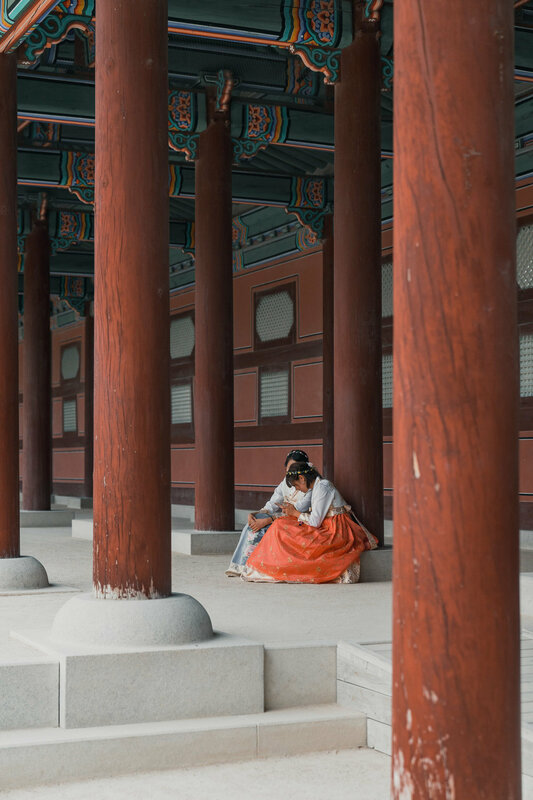 Seoul has been Korea’s capital for over 600 years and it’s amazing how much of its culture and national monuments have been preserved. 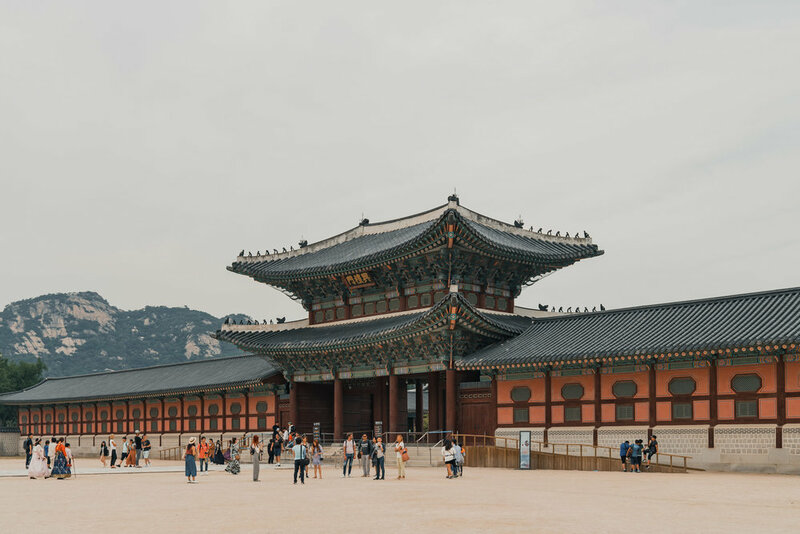 Palaces also show how long its history is and it’s a great place for someone who visits and want to learn more about Korea’s history. During its post war period, often called as Miracle on the Hang River, South Korea experienced rapid economic growth, modernization, and industrialization. It’s amazing how in just a few decades, South Korea was able to get back up and transform itself in a very highly developed country. South Korea has been the host of a few global events like 1988 Summer Olympics, 2002 FIFA World Cup, 2010 G20 Summit, and the recently concluded 2018 PyeongChang Winter Olympic Games. 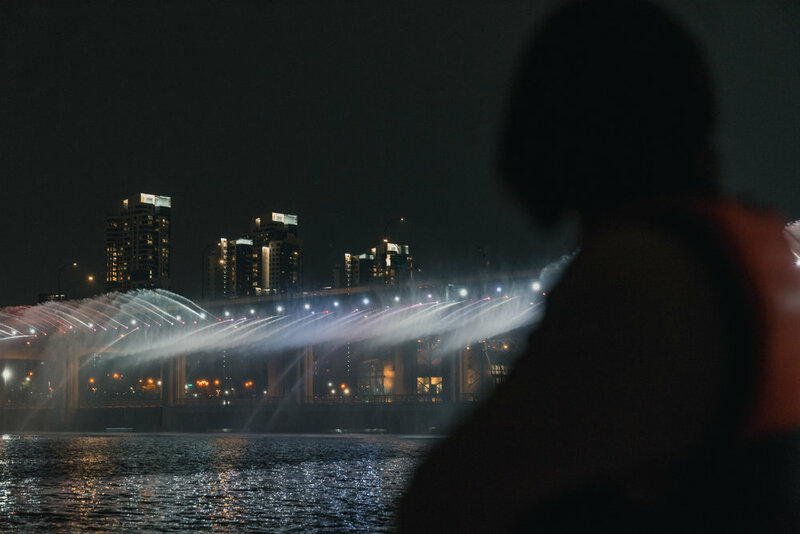 Seoul is divided into two regions by the Hangang, a river that passes through the heart of the city. Most of the palaces, markets, and other cultural attractions are usually found in Gangbuk or “North of the River”. Most of the latest trends and Seoul’s modern character is found in Gangnam or “South of the River” (yes, Gangnam from Psy’s song haha!). There are a lot of places to see in Seoul including cafes, clubs, bars, etc. 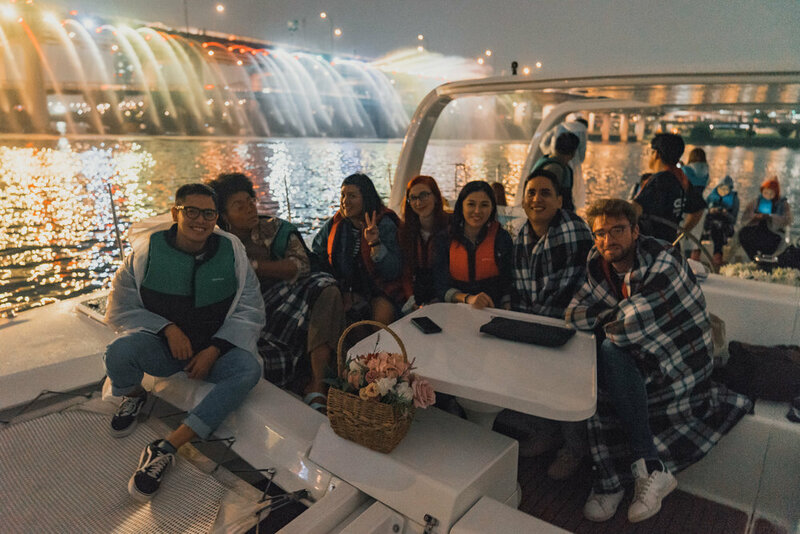 So there’s definitely a lot to see around Seoul! Anyway, back to my early morning adventure. Lol! It took me around an hour to get to the hotel from the airport. It was really nice to see a preview of what Seoul was from the ride and the sunrise was such a perfect start to the trip! I arrived at the hotel and was greeted by Sunny of Seoul Metropolitan Government, one of the lovely people who helped make this trip happen! I checked in my room, had breakfast, and literally passed out. Lol! We had the whole day to ourselves so I decided to just check out the places near our hotel. Later that afternoon, I finally got to meet everyone else on the trip! I was so happy to see familiar faces during this trip which made me even more excited to share this experience with them! We began the following day checking out Seoul City Hall! Located in Tapeyeongno, Jung-gu. If you see it now, you’d notice an old looking building connected to a modern looking building attached behind it. It will definitely catch your attention if ever you end up passing by it. The old city hall was built in 1925 during the Japanese occupation of Korea. They built this modern building in 2008. The old city hall now serves as a cultural asset and as a library with over 200,000 books. It was one of the nicest looking city halls I’ve ever seen. The light coming inside was just perfect and loved the architecture of the place. For me, the place wasn’t only a government building but it was also a large beautiful art piece. You would hear me say “Wow!” every time they introduce a different section of the place. This place even holds the world record for the tallest vertical garden (7 floors high!). I loved going around this place because every time you look up, or look down from a balcony, the place looks different every time! Next, we headed to the Institute of Traditional Korean Food (“Tteok” Museum)! Our next activity for the day was to learn how to cook Bibimbap (literally means mixed rice), one of the known dishes from Korea. The other cool thing was we get to have what we cooked for lunch. I wasn’t too confident with my cooking skills so I let my friends who are much better at the kitchen do most of the cooking lol! I mostly just cheered and help clean the area. The interesting thing we learned about Bibimbap is that the different colored ingredients represent a lot of organs in our body. Red for our heart, yellow for our stomach, green for the liver, white for the lungs, and black for the kidneys. It was a pretty cool and nice fact about bibimbap! It really helped make the experience more special. Next on the agenda was the birthplace of Korean sewing industry. Ium Pium is one of the 20 new spots in the city of Seoul’s Urban Regeneration Project. The museum can be found in Changsin-dong neighborhood. The museum is Korea’s first sewing history museum and it opened last April 2018! The museum includes a Sewing Master Memorial Hall, Sewing History Hall, a shop, and a place to get a shirt printed on. We arrived and got a quick tour of the museum and before we got to try out their computerized sewing machine! It was pretty cool. They also let us go wild with designing our own tote bags with their available stamps. One of the reasons why I was so excited for this trip is I finally get to see Dongdaemun Design Plaza (also known as DDP) in person! I’ve seen photos online but and always thought that this place is beautiful! 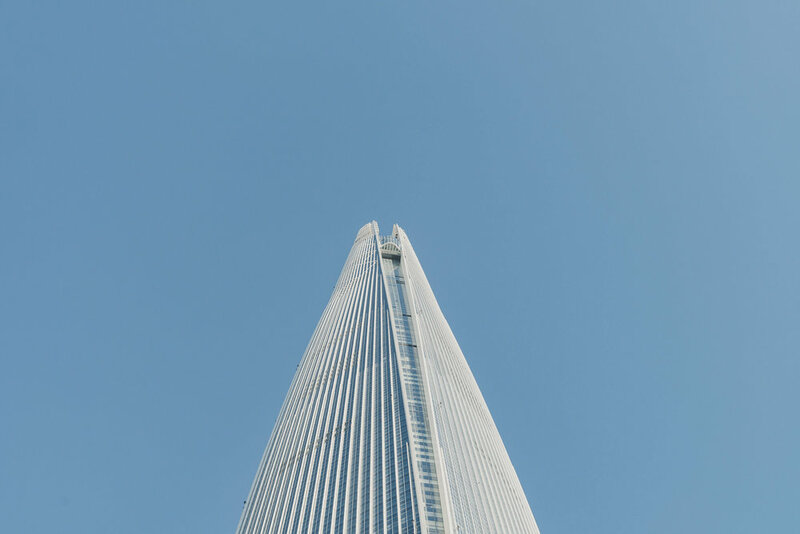 Constructed in 2009 and inaugurated in 2014, this building is one of Seoul’s landmark for major urban development. It was designed by Zaha Hadid and Samoo. It’s really hard to miss when you pass by it because of how futuristic the design is. We even got to check out the co-working space on the second floor. I’d definitely jump on the chance to call this place my “office” if I had the opportunity to. Haha! I don’t think I’ll tire of seeing this everyday. After our trip to DDP, some smart guy forgot his spare batteries in the hotel (me) and had to go back and get it. Sadly, since I had to go back to the hotel, I missed the chance to see Ikseon-dong. From what I heard, it was a really nice area for restaurants and shops. Totally kicking myself for missing this but I guess it’s something I’ll just have to do in my next trip! Anyway, I caught up with everyone ay N Seoul Tower. It was really cool to see how alive Seoul is at night from the tower. What a nice way to end the day. Across the World Cup Stadium, is the Mapo Oil Depot. Just like the other places we’ve been to this trip, Mapo Oil Depot is also part of Seoul’s revitalization project. Over the past 41 years, this grade-1 security facility’s access was restricted to the public. On September 2017, it opened its doors to festivals, performances, exhibitions, markets, etc. It has been transformed into an environmental friendly cultural space for the public. The place is about 22 football fields big and is composed of 6 different tanks that each has a different function. T1, Glass Pavilion. An exhibition hall with a glass ceiling. / T2, Performance Hall. An outdoor stage and a performance hall at the basement floor. / T3, Original Tank. It retains the original shape of the tank / T4, Complex Culture Space. A stage for performances and exhibitions with light entering through the ceiling. / T5, Story Hall. The 40-year history of Mapo Oil Depot is narrated and is preserved in this room. / T6, Information Exchange Center. A space for conferences and also houses a cafe. Our next stop is MBC World / MBC Broadcasting Station. We definitely had a great time checking out the theme park inside the station. We even got to experience what it was like to be a new anchor! So much giggles and laughs were shared this day. If ever you’re into K-Pop or know any faces from the broadcasting company, it would definitely be a great place to see and check the fun exhibitions they have. They even have green screen photo booth sessions with famous K-Pop artists! Dak-galbi / I just had to share what we had for lunch that day. It was definitely my favorite during the trip! After our yummy lunch, we headed our way to one of Seoul’s famous palaces - Gyeongbokgung Palace. It is also known as the Northern Palace because of where it is situated. It’s amazing how well-preserved this place is considering it was built in 1395! It was destroyed during the Japanese occupation but thankfully was restored during King. Gojong’s reign. 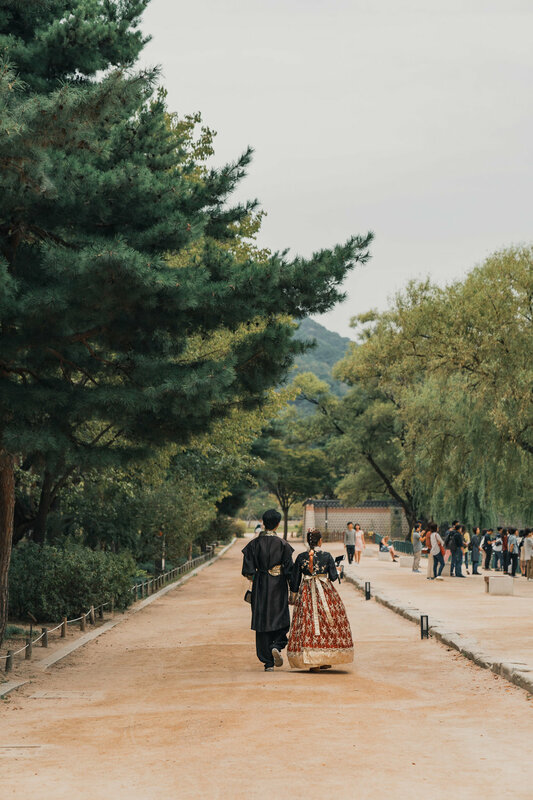 As touristy as it sounds, I think trying out the Hanbok and walking around the palace wearing it completes the whole experience of being inside Gyeongbokgung Palace. 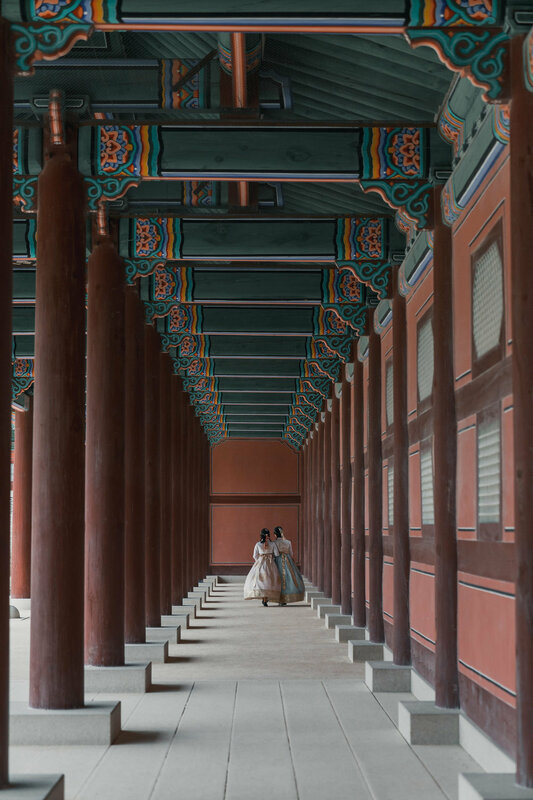 You would see a ton of people walking around wearing South Korea’s hanbok. I love how colorful and beautiful all the hanboks are! I kind of regret trying it out but it’s fine, I got to see a bit more of the palace during our visit here. To end the day, we boarded a boat to check out the Rainbow Fountain. It was my first time seeing a fountain mounted on a bridge so I thought it was pretty cool! It was surprisingly a very cool experience. The way the water dances and how to light changes was mesmerizing! The fountain currently holds the Guinness world record for being the longest bridge fountain (1,140m). During our last tour day, we got to meet the members of New Kidd! They are a male idol group signed under J-FLO Entertainment. It was an awesome experience to actually see and learn how hard they work to improve their skills. The rest of the day was spent checking out the malls in the Gangnam district. What caught my attention was this giant underground library in COEX mall! Definitely something to see when you’re shopping in the area! Holly, Jess, and I decided to stay for a couple more days after the tour and we got to check out a few more places before finally saying goodbye to Seoul. We first checked out Seoullo 7107. 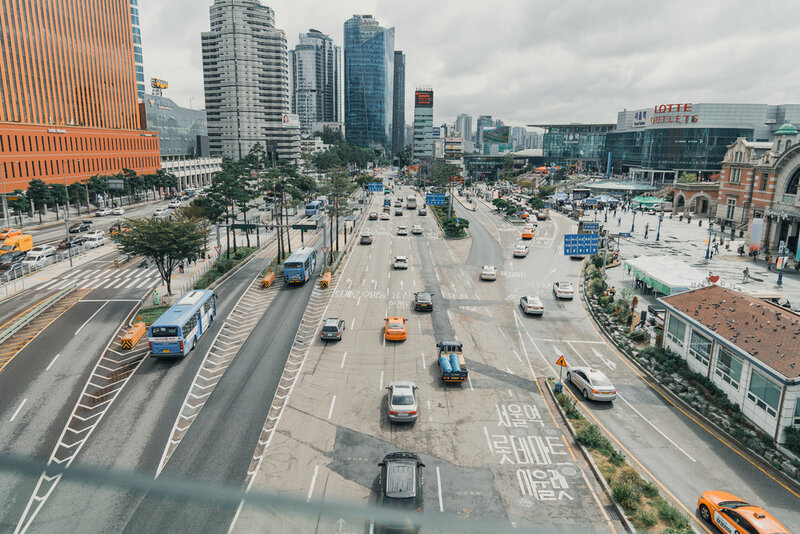 An interesting fact about Seoullo 7017 is it used to be an elevated road that was built to connect the eastern and western sides around Seoul Station. Sadly, the road was closed due to safety and traffic issues. Instead of getting rid of the whole structure, they decided to convert it into a sky garden. We also checked out Ewha Womans University. Another thing to check out if you have time. It actually made us feel like being in an XMEN movie set! 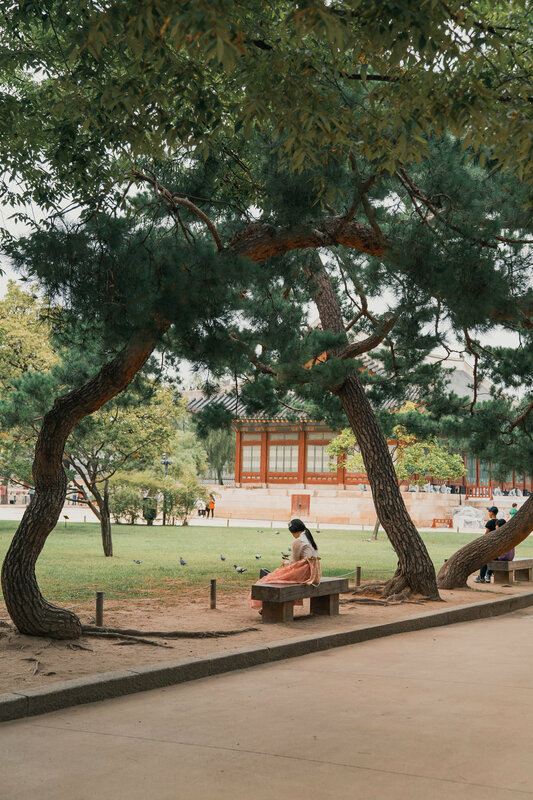 So many beautiful sights to see around Seoul. 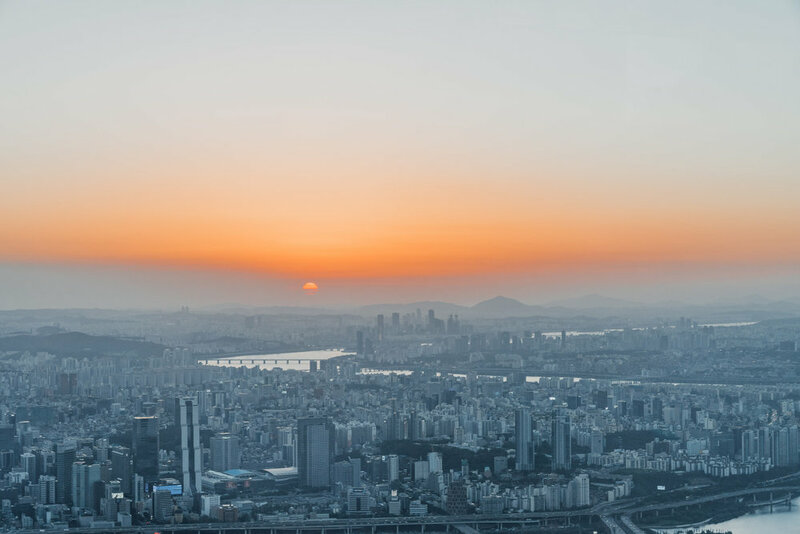 We decided to spend the rest of our last full day in Seoul going up the Lotte Tower and checking out the view. I was blown away at how beautiful the whole city is! And we came at the right time too! During sunset! It was nice spending our last day watching (and photographing) the sunset from the viewing deck of the 5th tallest building in the world! That concludes my Seoul Trip! I really wish I had more time to check the other places out but I guess I’ll just have to save that for the next trip! I really enjoyed seeing a bit of South Korea and its culture. I finally understand why people who’ve been to Korea instantly fall in love with the place. You definitely have to experience it to understand. But I hope I was able to also give you guys a sneak peak into what Seoul is like! Disclosure: I was invited by the Seoul Metropolitan Government to join the Seoul Press Tour. All opinions are my own.